Hello there athletes, parents, coaches and fitness connoisseurs. I bet the last time you went to the gym you passed by the rowing machines because at first thought the idea of sitting down, endlessly rowing back and forth sounded like a pointless, boring workout. Well, is it really pointless and does it deserve to be passed by time and time again? Lets dust off that rowing machine and see what it has to offer. It turns out that despite common perception rowing machines can provide you with a great full body workout. These machines tap into all areas of fitness, helping you improve your muscular endurance, strength and power and train your energy systems both aerobically and anaerobically. In order to focus on either strength or aerobic capacity more specifically you must become familiar with a lever on the side of the rowing machine’s fan cage called the damper. In general, lower damper settings are best for aerobic workouts, while higher damper settings make rowing more of a strength workout. To develop more power in either your strength or aerobic rowing workout you have to drive hard with your legs, back and arms, making your movements more explosive. If you are really ambitious you can get a great aerobic workout that doubles as a strength building routine when you row by increasing the damper setting while still maintaining a high stroke rate/minute. What more can you ask for? By developing your aerobic capacity on the rowing machine, you can increase heart health, speed up your metabolism, improve your hormonal profile and decrease your susceptibility to illness and disease. According to a study done at the University of Illinois, aerobic fitness also plays a role in maintaining and enhancing central nervous system health and cognitive function. Strength training provides even more health benefits and can help you build strong bones, increase lean muscle mass and help you burn calories hours after your workout is complete. The American Heart Association says that strength training assists the body in expending calories via an increase in lean body mass and basal metabolism. 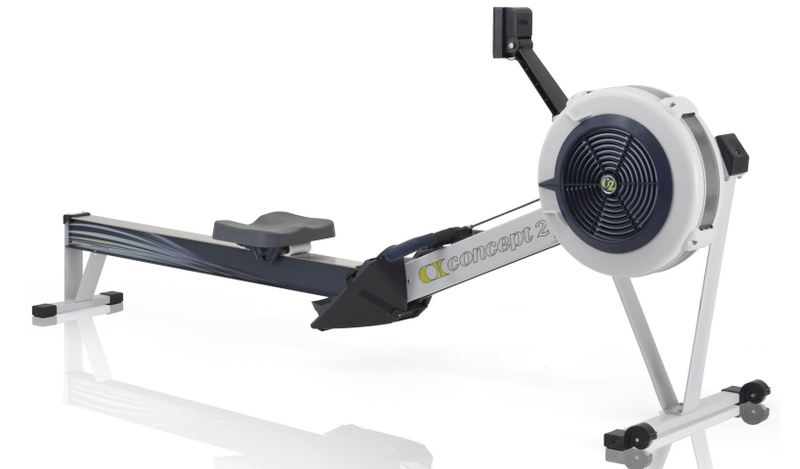 Today we are going to look at the four phases of rowing using the Concept 2 rowing machine and the specific muscles that are worked in each phase so that you can start rowing today and reap the benefits discussed above. Phase One: The Catch In the catch phase your body is in a compact position with your legs compressed close to your chest. Your arms are fully extended and your back is in an upright position. Your abdominal muscles are working to flex your torso slightly forward. Phase Two: The Drive The drive phase is where your leg muscles are activated and the muscles of your upper body are put under the greatest stress. This phase is initiated by driving your legs forward away from your upper body and then transmitting the power generated by your legs into the handle of the rower through your back and arms. At the end of this phase your legs are almost fully extended and your arms have a slight bend at the elbow. Phase Three: The Finish During the finish phase your legs are fully extended and your arms are bent past 90 degrees so that the handle of the rowing machine is pressed up against the lower part of the sternum or the zyphoid process. Your abdominals contract during this phase to hold your body in a position where your back is titled back at approximately a 110-130 degree angle. Your biceps and back muscles are also contracting, with your scapulas pinched together to maintain this position of tension. Phase Four: The Recovery During the recovery phase your triceps and abdominals are engaged in order to bring your arms and torso forward. The hamstrings and the anterior tibialis then contract in order to bring your body back into phase one, the catch. Come into EZIA to test your 1000 Meter Row time at the next EZIA Challenge. Or, if you are interested in Personal Training at EZIA, you will test your 1000 Meter Row time in your first “EZIA Experience”. Start by filling out the application or call us at 760.804.1700.